Bárbara Hernández Huerta was a busy woman during the first stage of the IWSA World Cup series that kicked off with the 10th Jelgavas Roni Cup in Latvia. 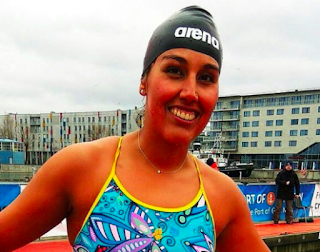 Among the 231 swimmers, not only did Hernández win the 450m endurance swim in 6:28.29, but she also competed in the 25m butterfly (18:32.30), 50m breaststroke (48:11.24), 50m freestyle (35:52.24), 100m Freestyle (1:17.48), and the 25m breaststroke (22.45), collecting a whopping 138 points for the series' first event. Christof Wandratsch of Germany collected 141 points for the 14:64.27 25m butterfly, 1:04:85 100m freestyle, 38:36 50m breaststroke, 17.93 25m breaststroke, 29.79 50m freestyle, and 5:32.89 450m endurance freestyle.